Book direct and 60 days early, save 5%. Tuesday, September 17 - Travel Day. Depart Atlanta for Munich at 4:50 pm on Delta #130. Wednesday, September 18 - Arrive in Munich 7:00 am. Bus to Augsburg. Check into Hotel Ibis (10:00 am). Walking tour Augsburg in afternoon. Dinner at Augsburg's Hauptbahnhof Brauhaus. Thursday, September 19 - Bus to Fussen. Stops at Wieskirche and Landsberg. In Fussen see Neuschwanstein. Return to Augsburg. Friday, September 20 - Bus to Munich. Walking Tour of Marienplatz area (Haupt). Lunch at Hofbrauhaus. Afternoon and evening at Wiesn (Oktoberfest) Fairgrounds. Check into Hotel Ibis Munich City West. Saturday, September 21 - Bus to Chiemsee. See King Ludwig's Palace at Herrenchiemsee. Bus to Berchtesgaden area. See Koenigssee. Dinner in the town of Berchtesgaden. Bus to Freilassing. Stay at Hotel Krone. Sunday, September 22 - Bus to Salzburg. Walking Tour (Haupt) of Altstadt Salzburg. Visit shops. Bus to Goldach (bei Munich). Stay at Hotel Alter Wirt. Monday, September 23 - Bus into Munich. Visit Wiesn Fairgrounds and or shops. Return to Hotel Alter Wirt. Tuesday, September 24 - Bus to Munich Airport at 7:30 am. Depart from Munich for ATL at 9:50 am on Delta #131. For this tour you must have your passport by Aug. 16 or have applied for one by that date. Tour includes comfortable lodging arrangements. Two per room with private bath. For additional photos of lodging and transportation, click here. $2140.00 ground costs (based on total of 10 travelers) total cost in US dollars (This cost is based on the current US Dollar - Euro exchange rate: Dec 2, 2018 of 1.14 USD = 1 Euro. If fewer than 10, then total = $2270.00 per person if 9; total = $2470.00 per person if 8; total = $2720.00 if 7; total = $3070.00 if 6. Per person costs will come down further if more than 10 travelers. minimum 6 travelers - maximum 26 (but flexible). Cost includes: RT air fare (Delta); Lodging (2 per room) inc breakfasts; Bus Transportation (6 days), all admissions, overhead and taxes: and all meals ($40.00 max per day for L+D). RT Flight portion ATL-MUC estimated to be: $1053.00 as of Dec 2, 2018 (includes all flight taxes and a $30.00 fee to Starr Travel). Total "on-the-ground" miles traveled = 400 miles. **Be sure to contact Haupt Germany Tours first before contacting Starr Travel (or purchasing flight tickets). If you choose to use Starr Travel, flight ticket checks payable to Starr Travel. On-the-ground costs checks payable to Haupt Germany Tours. Once tickets are secured, you will be sent an invoice approximately 10 days prior to each payment date for remaining costs. Payments are to be mailed to addresses found on our contact page. Thursday, September 26 - Travel Day. Depart Atlanta for Munich at 4:50 pm on Delta #130. Friday, September 27 - Arrive in Munich 7:00 am. Bus to Augsburg. Check into Hotel Ibis (10:00 am). Walking tour Augsburg in afternoon. Dinner at Augsburg's Hauptbahnhof Brauhaus. Saturday, September 28 - Bus to Fussen. Stops at Wieskirche and Landsberg. In Fussen see Neuschwanstein. Return to Augsburg. Sunday, September 29 - Bus to Munich. Walking Tour of Marienplatz area (Haupt). Lunch at Hofbrauhaus. Spend afternoon at the Wiesn (Oktoberfest Fairgrounds. Check into Hotel Inis Munich City West. Monday, September 30 - Bus to Chiemsee. See King Ludwig's Palace at Herrenchiemsee. Bus to Berchtesgaden area. See Koenigssee. Dinner in the town of Berchtesgaden. Bus to Freilassing. Stay at Hotel Krone. Tuesday, October 1 - Bus to Salzburg. Walking Tour (Haupt) of Altstadt Salzburg. Visit shops. Bus to Goldach (bei Munich). Stay at Hotel Alter Wirt. Wednesday, October 2 - Bus to Rothenburg ob der Tauber. Walking Tour (Haupt) and time to visit many shops. Return to Hotel Alter Wirt. Thursday, October 3 - Bus to Munich Airport at 7:30 am. Depart from Munich for ATL at 9:50 am on Delta #131. 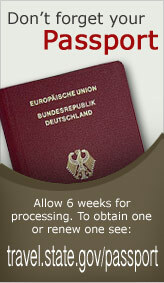 For this tour you must have your passport by Sept. 1 or have applied for one by that date. Cost includes: RT air fare (Delta); Lodging (2 per room) inc breakfasts; Bus Transportation (6 days), all admissions, overhead and taxes; and all meals ($40.00 max per day for L+D). RT Flight portion ATL-MUC estimated to be: $1103.00 as of Dec 2, 2018 (includes all flight taxes and a $30.00 fee to Starr Travel). If you choose to use Starr Travel, flight ticket checks area payable to Starr Travel. On-the-ground costs checks payable to Haupt Germany Tours. Once tickets are secured, you will be sent an invoice approximately 10 days prior to each payment date for remaining costs. Payments are to be mailed to addresses found on our contact page. Friday, October 11 - Arrive in Munich about 7:00 am. Train to Augsburg. Check into Hotel Ibis. In afternoon, do a walking tour of Augsburg (Haupt). Dinner at Augsburg's Brauhaus 1516 at the Bahnhof. Saturday, October 12 - Train to Fussen. See Neuschwanstein Castle. Lunch in Fussen. Return to Augsburg. Sunday, October 13 - Train to Salzburg, Austria. Do a walking tour of Salzburg (Haupt). See many sights from "Sound of Music". Dinner in Salzburg. Stay at Der Salzburger Hof. Monday, October 14 - Train to Munich. Check into Hotel Ibis Munich City West. Do a walking tour of Marienplatz area (Haupt). Dinner at Hofbrauhaus in Munich. Tuesday, October 15 - Spend a little more time in the pedestrian shopping precinct of Munich and then train to Goldach. Check into Hotel Alter Wirt. Wednesday, October 16 - Shuttle to Munich Airport at 7:30 am for a 9:50 am on Delta #131 return flight to Atlanta. For this tour you must have your passport by Sept. 16 or have applied for one by that date. The accommodations for this tour are budget friendly lodging locations - all of which I have stayed at before and can highly recommend for cost savings, comfort, and service. Two persons per room with private bath and conveniently located near train stations. For additional photos of lodging and transportation, click here. Instead of using bus service, this tour offers the experience of traveling like a German. We will be using the S-Bahn train from the Munich Airport to Downtown Munich and Downtown Munich to Freising (near the airport). We will use the DB (or Deutsche Bahn) trains for all other travel. A shuttle van will be used from Freising to the Airport. $1770.00 ground costs. This is a flat fee regardless of number of travelers. RT Flight portion ATL-MUC is estimated at $1203.00 as of Dec 2, 2018 (includes all taxes and a $30.00 fee to Starr Travel). Cost includes: five single-day Bavaria Rail Pass; five nights lodging (inc breakfasts), all admissions, overhead and taxes; and all meals ($40.00 max per day for L+D). Cost based on a minimum of five travelers. Cost will not change if more than 5 travelers. Cost will fluctuate with USD/Euro conversion rate. Currently this is 1.14 USD = 1 Euro as of Dec 2, 2018. minimum 5 travelers - maximum 20 (but flexible). On-the-ground miles traveled is about 500 miles. If you choose to use Starr Travel, flight ticket checks are payable to Starr Travel. On-the-ground costs checks payable to Haupt Germany Tours. Once tickets are secured, you will be sent an invoice approximately 10 days prior to each payment date for remaining costs. Payments are to be mailed to addresses found on our contact page. Dates back to 1810 when Crown Prince Ludwig I married Princess Therese on Oct. 12. Citizens of Munich were invited to join the festivities held in the fields outside of the city gates. The fields are called Theresianwiese (or Theresa's Fields) ever since. Today, the festivities are known by the Germans as Wiesn. Oktoberfest is the world's largest folk festival with 6 million visitors per year.